This one needs a story. It happened today. David stayed home from school because he was sick so we went to Costco. He was a big help to me and when I was in line with Seth and Sarah, I sent him with money to buy the hotdogs. He did it successfully and even assisted Seth in getting some ketchup. We were heading out the door with full cart and hot dogs when I noticed he was looking longingly back at the vending machines. He can’t stay away from them; they are a boy’s dream come true- with food, slots for money, a door that lets out good stuff, and maybe money got left in it or rolled under it.. “Mom, can I go get something from the vending machine with the change from the hotdogs?” I looked at him. He asked so nicely, and since he was such a help, I said yes. While he was busy with that, I went out to the car to start loading in Seth and Sarah and about 350 pounds of bulk foods. Dave arrived, hopped in, and away we went. “What did you get from the vending machine”? I asked politely. 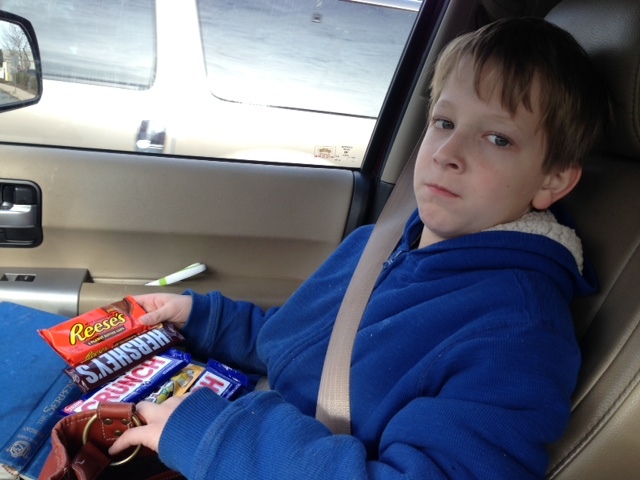 He proceeded to pull out FIVE CANDY BARS FROM HIS POCKET, surprise. He had used ALL the money leftover from the hotdogs to buy FIVE full sized candy bars!!! One entire dollar each. I was not happy and I lectured him. In conclusion (to the lecture), I told him he could have one, and that he could give the rest to his siblings for Christmas stocking stuffers. Looking at the picture, it hurts my heart that I had to make him give up four. But one must learn moderation. One candy bar is enough and enough is as good as a feast. Oh, yeah! My kind of food. Which one will he keep? I wouldn’t be able to choose out of that yummy selection. I’m sorry David is sick and hope he feels better soon. You definitely had to record this one. Someday he’ll love reading this story and I’m sure it will be a tale to tell his own young ones. What a surprise for those stockings! His eyes were certainly too big wanting all those candy bars. lol Good solution from you Mommy. Don’t feel bad, all that sugar wouldn’t help his body to fight the illness! He is terribly sweet looking with that long face though. Awww! ;) that was definetly a keeper memory! What a sweet boy! Good way of handling the situation. He will remember it:). Boys are just sweet, I have four. “enough is as good as a feast” Loved this!! (and to remind MYSELF of those words of wisdom. I love it, Shanda. Your boy is sweet and sounds like my Bryant. 🙂 You are a wise mama. Your solution was perfect.